It can be hard to entertain a large group of teens inside if you don’t want to rely on planting them in front of electronics. 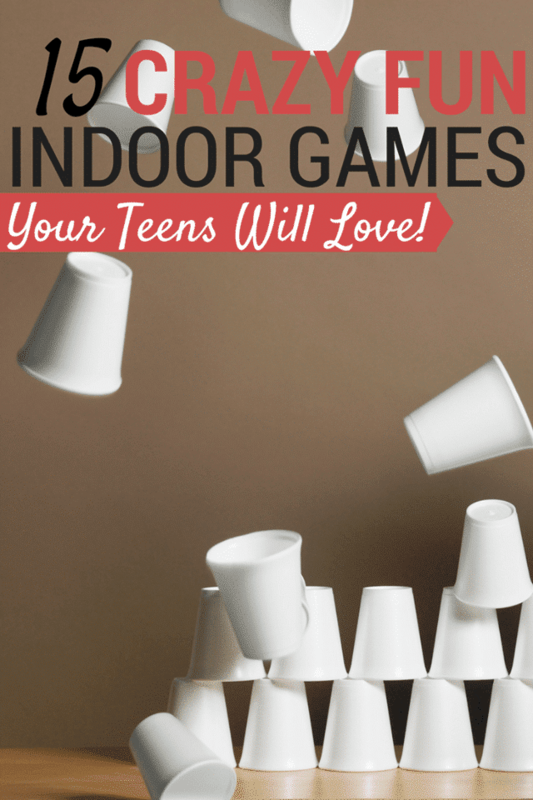 These fun indoor games for teens will get the kids up and moving, and they’ll have a great time in the process! Don’t forget to click “Next” at the bottom of the page to see the rest of the game ideas. And feel free to check out all of my indoor games and ideas. When my son was in high school he wanted to throw an end-of-season party for his wrestling team. I was all for it but was a little nervous about how I was going to keep over a dozen high school boys occupied so they wouldn’t get bored and turn my house into a giant wrestling mat. Since the weather at the end of February is typically pretty miserable here, I wanted to come up with several indoor games for teens that would give them a chance to be active even though we’d be inside. Grab a printable version of all the ideas from this post when you subscribe below. 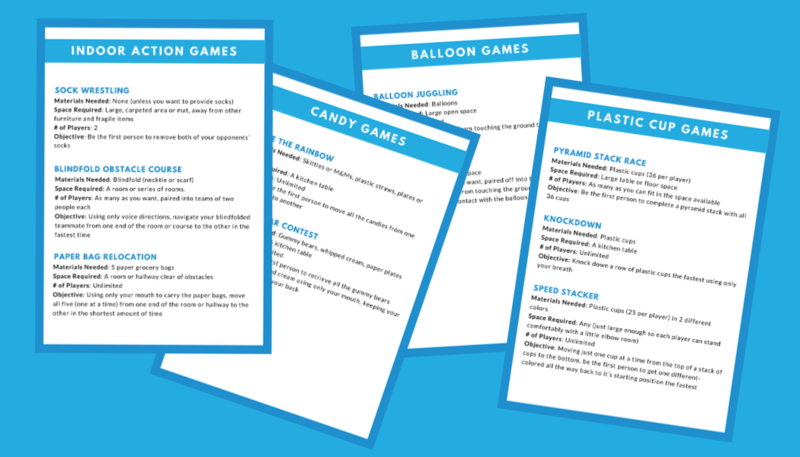 Free Printable List of Games! If you have a large, open space in your home you can help the teens expend some energy with these totally indoor-safe games. Even better, all of these games are played with items you already have on hand! Clear a large space in the center of a carpeted room. Two players face off wearing socks but no shoes. The first person to remove both of his opponent’s socks wins. Since we had a bunch of wrestlers, we used wrestling rules to determine legal moves. For the most part, you’ll want to establish rules that prevent serious injury or property damage. Have everyone pair off. Each team has one person wear a blindfold while the other person navigates him or her across a room filled with obstacles (a coffee table, chairs, a vacuum cleaner). The team that accomplishes the task the fastest, wins. When played indoors, you want to have one team go at a time and use a timer to track how long it takes each team. Get 5 paper grocery bags and cut each one to a different height. Line up the bags on one end of a room or hallway. Each player must move all 5 bags from one end of the room or hallway to the opposite end. The trick is they can only use their mouths to pick up the bags and their hands cannot touch the ground to help them maintain balance when the bend over to retrieve the bags. The player that accomplishes the task the fastest, wins. The best thing about candy games is that the supplies you purchase for the games double as snack food when the games are over! Players race to pick up as many Skittles as they can using only a straw. If you prefer, you can use M&M’s instead of Skittles. Fill a plate with whipped cream and hide a bunch of gummy bears in them. Players have to hold their hands behind their back and retrieve all of the gummy bears by using just their mouths. Haven’t found the right activity yet? Don’t worry! We’re just getting started. Check out my post Fun Games for Teenagers for board games and smartphone games that are perfect for teens. Click the button below to view more indoor teen party games using balloons and plastic cups. Plus, find prize ideas that are teen-approved! Is there a place to download the video that was playing on the tv? I don’t think so. If you click through to YouTube on the video in the post, it will take you to the original video on YouTube where the creator lists several great additional resources and details (though not a link to download the game names video shown on the TV in the background). Try asking in the comments there and the video creator might be willing to add a link to share that video. Of course! I hope the party is a blast!